In less than a year since it’s been open, Coffee for Sasquatch has made big waves in the design world. 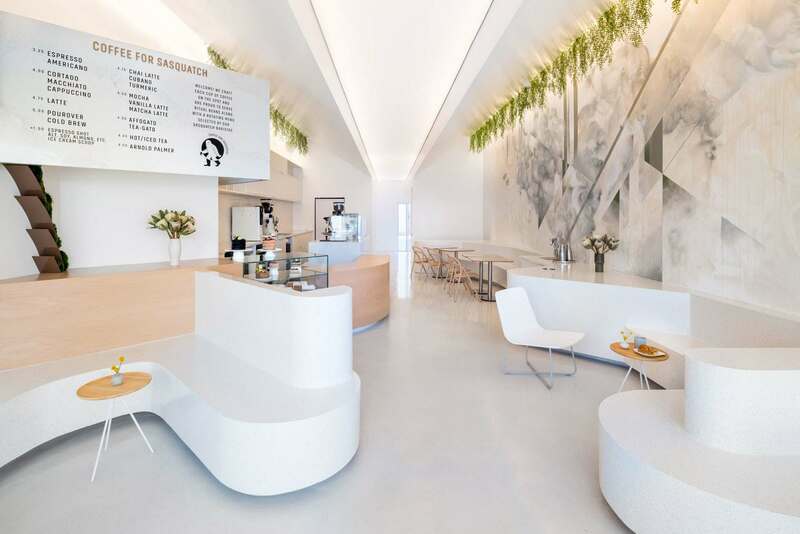 With the distinctions of 2017 honoree in Interior Design magazine and 2018 finalist in Architizer’s Design Awards already under its belt, this hip Los Angeles coffee shop designed by Dan Brunn Architecture has made quite the name for itself. So what’s the big deal? Here’s why so many people (including us!) love this magical coffee shop. Though it may serve as an escape for frazzled city-dwellers, Coffee for Sasquatch is undeniably LA. 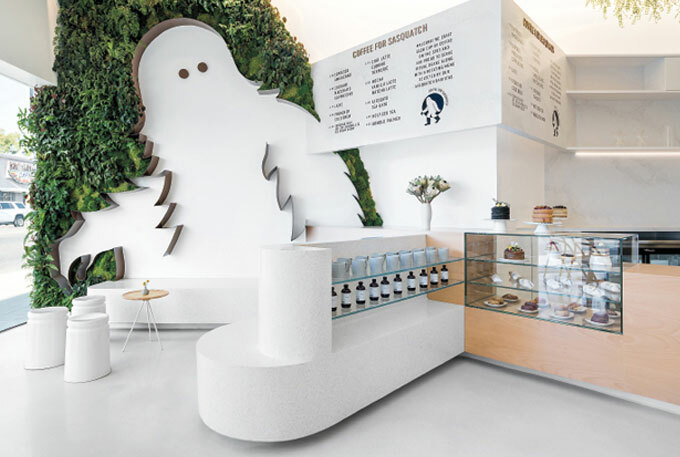 From the craft, seasonal coffees and teas to the vegan and gluten-free baked goods on display, it’s clear that the business was designed from the ground up to celebrate the passions, comforts, and indulgences of the people that call Los Angeles home. As such, even the back-to-roots vibe of the shop comes packaged with a modern flair. Opposite the coffee bar, the long wall is adorned with a gigantic, site-specific mural by Oakland-based artist Hueman, titled The Mist. 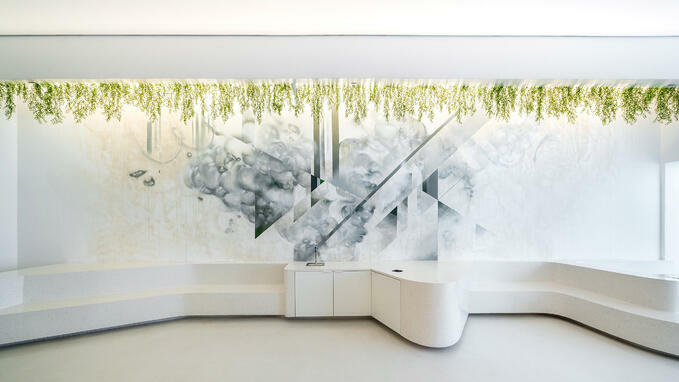 It’s stunning and ethereal, yet somehow resists the tendency of murals to be flashy or overwhelming, instead becoming part of the overall atmosphere. Coffee For Sasquatch was designed with the customer experience in mind, and it shows. 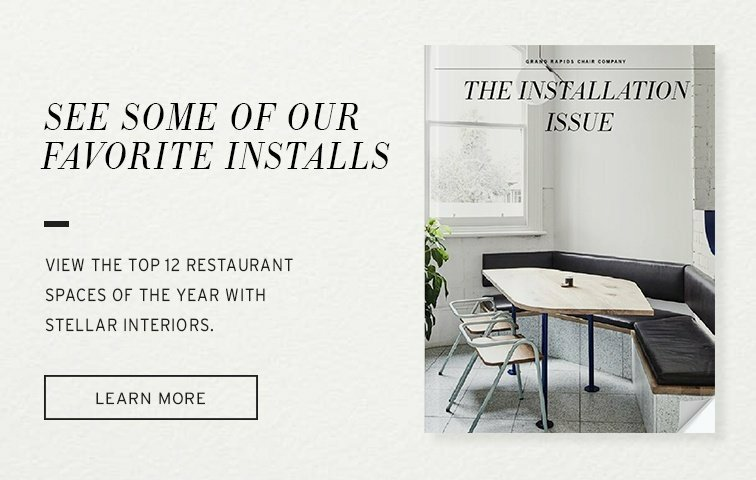 Every seat and table not only provide the perfect backdrop for ‘grammable menu items, but also give visitors the freedom to linger and relax in a way that’s comfortable for them. Beautiful beechwood chairs and tables serve as the bulk of the seating (except for the signature terrazzo banquette, of course,) supplemented by stylish cylindrical stools and our very own Harper Lounge Chair. Harper’s soft and simple profile complements the overall aesthetic of Coffee for Sasquatch perfectly. Dan Brunn Architecture opted for a white laminate shell to pair with the lounge’s x-base, and its clean, modern look integrates seamlessly with the other furniture. Its presence in this installation serves as further proof for Harper designer Joey Ruiter’s concept of exciting yet familiar pieces that are simultaneously strong, versatile, and visually striking. 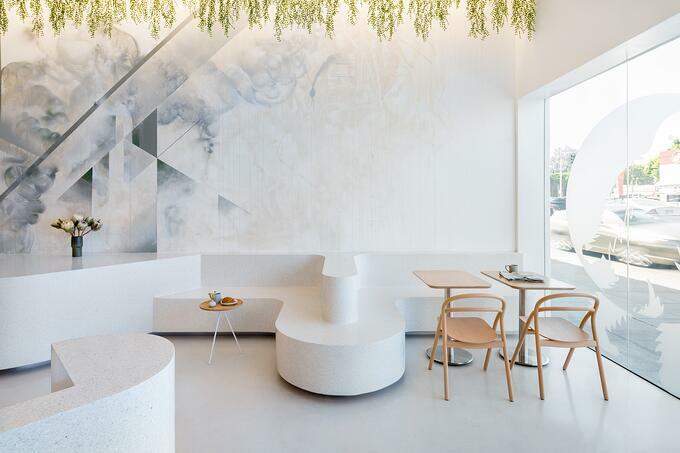 Overall, Coffee for Sasquatch is an incredible space with well-deserved design laurels. 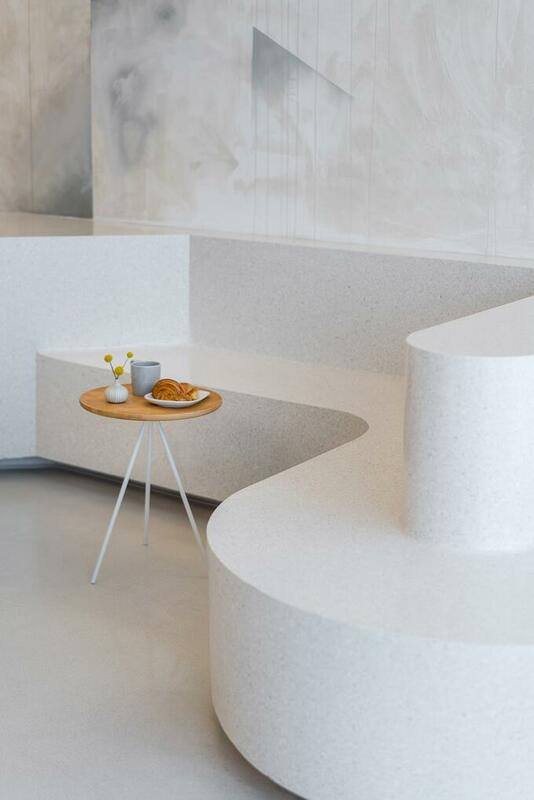 Amidst the growing trends of big and bold, a beautifully-executed minimalist design is almost as elusive as the coffee shop’s namesake. Coffee for Sasquatch is nothing short of a rare finding.